A series of big concerts kicks off in the Bay Area Tuesday night and runs through the weekend, with the Las Vegas tragedy on the mind of just about everyone involved. 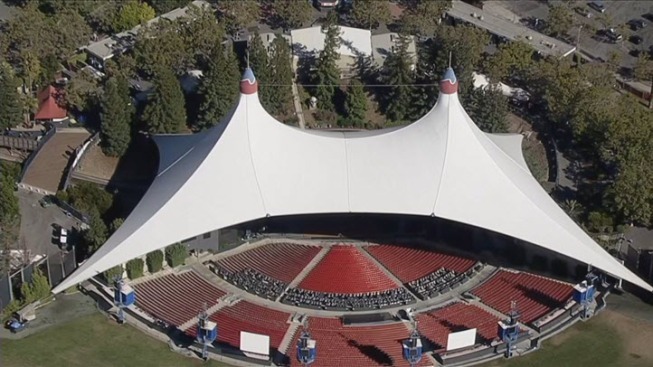 Imagine Dragons were set to play a sold-out show Tuesday night at Shoreline Amphitheatre, and while it's just two days removed from the largest mass shooting in modern U.S. history, some music lovers were ready to clear their minds and have a good time. But as people arrived at Shoreline with family and friends, they couldn't help but think about safety. "I'd be lying if I didn't say it was in the back of my mind," Bill Whalen said. For the Whalen family, who arrived early from Livermore to meet Imagine Dragons, the show must go on -- with precautions in place. "Each of us has ID, so if something did happen and we are separated, we all have ID if not our phones, so we can be identified at any given time," Dawn Whalen said. Mountain View's police department says security will, as always, be tight for the show. "I know that we did go out earlier and have another meeting to ensure every precaution is taken in terms of securing the venue," police spokewoman Katie Nelson said. The Whalens said they're glad to hear it. They also said they were ready to have a good time. "I just think you gotta keep that feeling alive and can't focus on the negative," Sarah Whalen said. "Focus on your name and keep going." "If you stop doing what you would naturally do, then they win," Bill Whalen said. "You want to take reasonable precautions, but in the end, you need to go on with your life." Another big show coming to town is Coldplay at Levi's Stadium on Wednesday night. Levi's officials said they too are taking security very seriously and that fans should expect a safe show.